The town of Schompf is in a furor. The recent troubles have been revealed to be part of a grand conspiracy. In response, the town priest has ordered the burning of a dozen heretical pamphlets (and their authors). There are some, however, who believe that more proactive steps must be taken to protect the town. 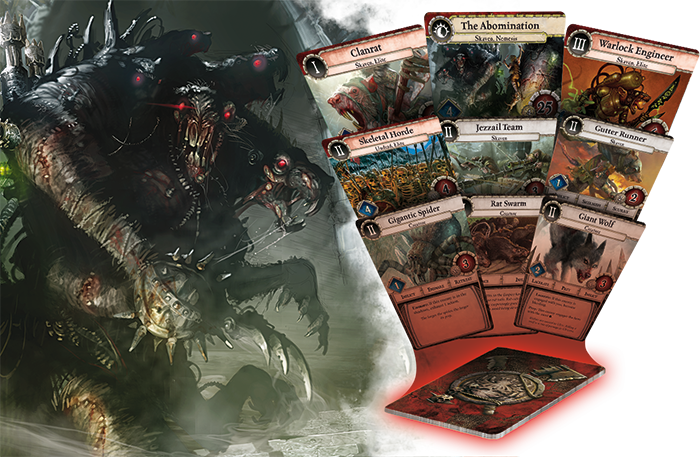 Warhammer Quest: The Adventure Card Game is scheduled to arrive at retailers in just a couple weeks, and you'll soon have your chance to save the perplexed and dying city of Schompf! 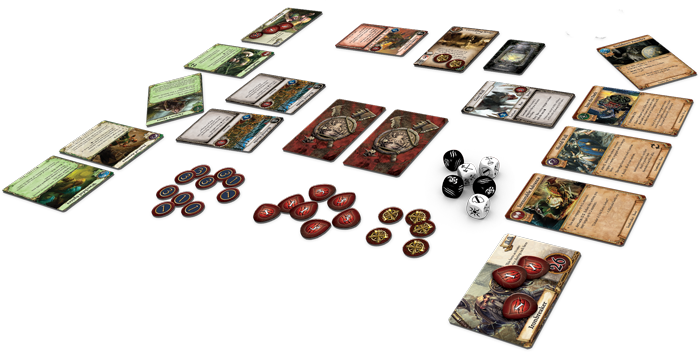 In our earlier previews, we've explored many of the game's core mechanics. We looked at the flow of your game round, we dissected the custom dice that drive the game's brutal battles, and we imagined the ways you might advance your heroes over the course of a campaign… should you manage to survive. 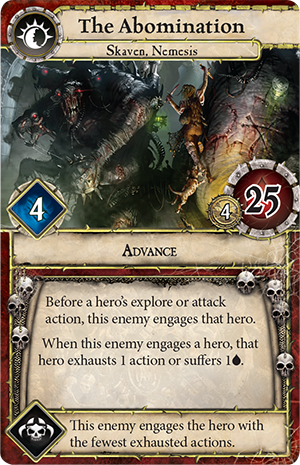 However, there's much more to Warhammer Quest: The Adventure Card Game than mere mechanics; at the game's core, there's one thing that trumps all the others: adventure! Today, we look at the different ways you can approach the game and the different types of adventures you can expect. A perplexed and dying city was on the verge of collapse until an unsuspecting rat-catcher named Jod began spreading tales of a peculiar odor— “more peculiar than usual”—emanating from the sewers. 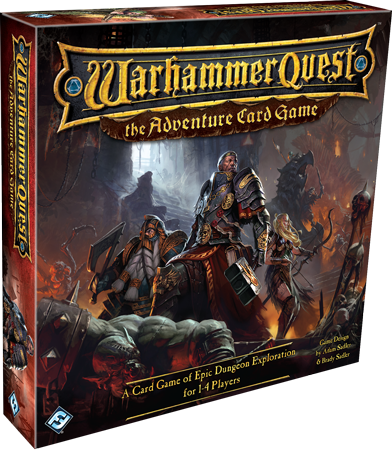 Warhammer Quest: The Adventure Card Game comes with two different campaigns. One is a random dungeon generator that allows you to play through a whole campaign in one session and with just one quest card. The other is a massive, five-part campaign that comes full of plot twists, terrible catastrophes, and deadly nemeses. It is through this larger campaign, "An Uneasy Alliance," that your heroes have the chance to come together and decide the fate of the troubled town of Schompf. Over the course of five quests, the adventure that starts with the spread of a sickness and the observations of a lowly rat-catcher becomes something much, much larger and far more dire than mere pestilence. Your adventures continue to revolve around Schompf and its plight, but they increase in scope with each new quest. "Enemies: Shuffle Giant Bats, Gigantic Spiders, Goblin Warriors, Orc Boys, 4 open standard enemies, and 2 open elite enemies together. Place the Odious Grump nemesis card in the nemesis lair; he spawns through peril effects." As the adventure's nemesis, Odious Grump is also its greatest evil, and his presence characterizes your adventure. He's sneaky, cruel, and opportunistic. Later on, though, provided you survive long enough, you'll no longer have to deal with Odious Grump, but with The Abomination , whose raw power and resilience are far greater than the sneaky Goblin's. Accordingly, The Abomination lends an entirely different feel to your adventure, as do the rats and Skaven enemies with which he is paired. Finally, the nature of the quest in which The Abomination shows is also decidedly different than that of Quest 1. In truth, only a few key qualities remain consistent between the adventures: the challenges before you are utterly brutal, your plight (or Schompf's) is desperate, and you'll need to draw upon all your strength and courage in order to survive! In the end, the adventures you undertake on behalf of Schompf will run for several hours over the course of five quests, grow increasingly difficult, and change in tenor from quest to quest. By the end—if you can make it there—it will be a good thing that the game allows you to advance and equip your heroes… you're going to need every last iota of your powers to survive the campaign's climactic battles! Once you've finally saved Schompf, or whenever you're in the mood to explore a random dungeon, you can undertake any of the nearly infinite number of quests permitted by the game's second campaign, "Lost in the Dark." While this adventure always begins with the same, relatively simple premise, it leads toward a wealth of possibilities that encourage an exhaustive series of expeditions. In short, you enter a dark and subterranean series of tunnels in search of fantastic riches and must fight your way through chamber after chamber until you emerge once more into the light of the Old World. You earn wealth and glory, or you die. Of course, since being able to advance your characters and your gear are such essential elements of the campaign experience, the quest sheet for "Lost in the Dark" introduces specific intervals at which you can advance your actions and upgrade your gear. Likewise, its setup ensures that the enemies you face will match your progress, gaining strength as you press deeper into their lair. "Enemies: Shuffle 15 open Tier I enemies and 9 open Tier II enemies together. Shuffle 9 open Tier II enemies and 6 open Tier III enemies together and place them under the first shuffled set. "Place the Odious Grump nemesis card in the nemesis lair; he spawns through peril effects. Set aside the Unkel and the Abomination nemesis cards; neither begins in the nemesis lair but both are moved there and spawned through peril effects." Because anytime you select a number of open enemies or locations, you do so at random, you never know what you're going to find within the choked corridors of "Lost in the Dark," and that's a good part of what makes it exciting. 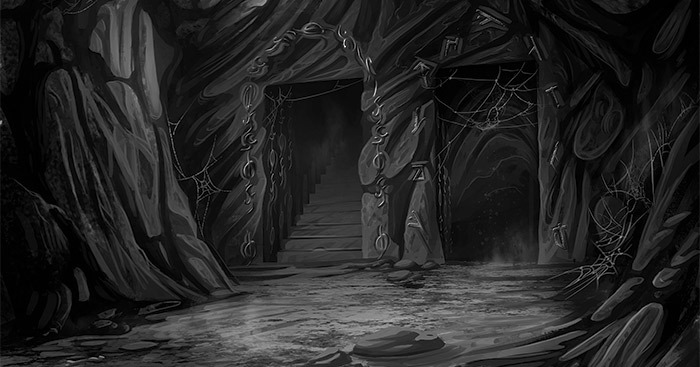 Random locations, random enemies, random gear, and a series of heated battles that grow increasingly brutal… "Lost in the Dark" is everything that you'd expect from a classic dungeon crawl, complete with the mid-game power increases, and you can easily progress through the whole campaign in a single session. Your torch is extinguished, and pitch black envelops the area around you. Slowly, the shuffle of movement and soft, guttural laughter grows louder as innumerable foes surround you. 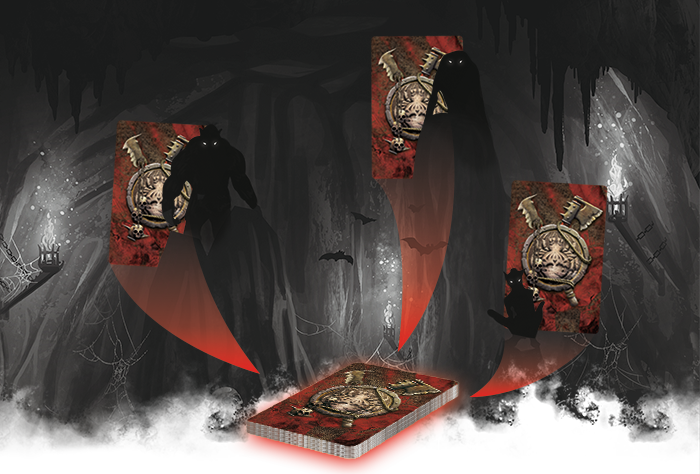 Whichever campaign you choose to play, when you sit down to a game of Warhammer Quest: The Adventure Card Game, you'll face innumerable foes, push desperately through the hidden chambers of darkened hallways, and enjoy hours of thrilling adventures. Meanwhile, your wait is nearly over. 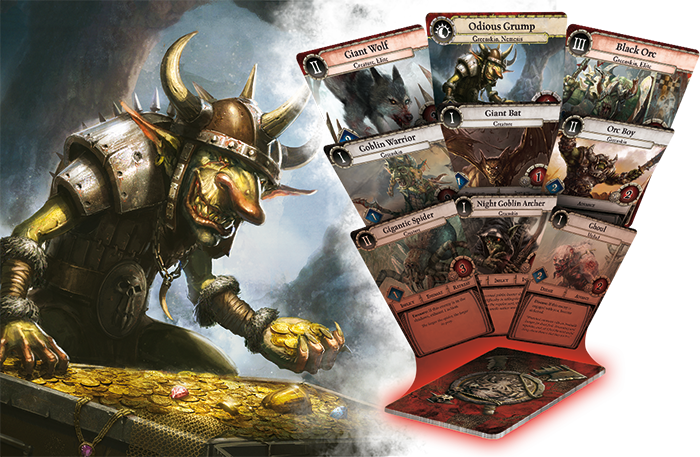 Warhammer Quest: The Adventure Card Game is due to arrive at retailers later this month! 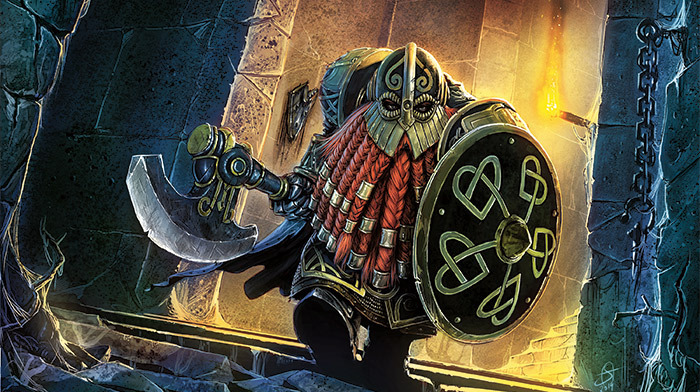 Join forces with legendary heroes in Warhammer Quest: The Adventure Card Game! You and up to three friends brave the many dangers of a cavernous dungeon while wielding potent weapons and magic. There are only two ways your quest can end – in death or in glory! 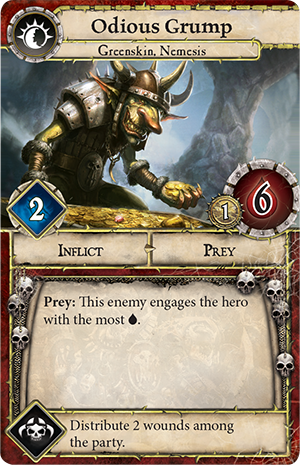 Warhammer Quest: The Adventure Card Game © Copyright Games Workshop Limited 2016. Warhammer Quest, the Warhammer Quest logo, GW, Games Workshop, Warhammer, The Game of Fantasy Battles, the twin-tailed comet logo, and all associated logos, illustrations, images, names, creatures, races, vehicles, locations, weapons, characters, and the distinctive likeness thereof, are either ® or TM, and/or © Games Workshop Limited, variably registered around the world, and used under license.